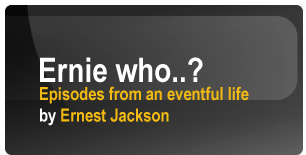 ErnieWho.com | Welcome | The book of the remarkable memoirs of Ernest Jackson. Ernie Jackson has led an interesting and varied life. Having survived the terrible Liverpool Blitz of 1941 his parents later separated and he lived with his mum in the poverty of a Liverpool tenement slum. The family were reunited for a short time before their young dad, a proud Liverpool dock labourer, died suddenly. The tragic loss was compounded by the fact that he had been the only bread winner. By the time he was twenty, having moved from job to job, Ernie was without ambition, means or future prospects. He was fortuitously also without any convictions and was able to join the Police Force. Over the next 27 years he rose through the ranks before retiring to go into business at 50. His success has enabled him to travel the world in luxury. These remarkable memoirs are a collection of the bizarre, amusing, poignant, romantic and proud. They have enabled the Author to discover who, why and what he is. Click 'play' to hear the interview or right-click the link to "Save As..."
Ernie Jackson, available for motivational speaking.